Five Rivers is a leading ecological and environmental contracting firm involved in all aspects of nature conservation and habitat management works - specialising in habitat management and creation works for the benefit of nationally and internationally rare habitats and species. With recent flooding hitting local areas quite hard over the winter, Five Rivers Environmental Contracting wanted to highlight their specific flood maintenance services. The marketing material was to be on the format of a leaflet that they would be placing through doors of relevant properties. This needed to be in keeping with their current branding and to use ‘Before’ and ‘After’ photographs from their portfolio. 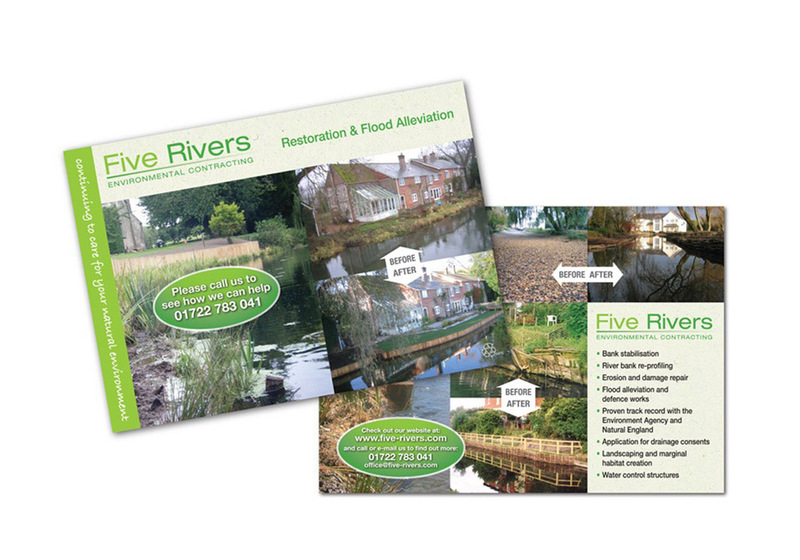 Having enjoyed a good working relationship with Five Rivers over many years we knew their brand well. This meant that we were able to design this leaflet in a slightly different style, giving it a more ‘sales orientated’ message whilst keeping it consistent with their Corporate ID. The fact it was a mail drop and had to compete with other leaflets and flyers meant the design had to be strong and the information clear and quick to understand by the recipients. Using distinctive imagery leading the eye through ‘before’ and ‘after’ shots we placed a ‘call to action’ to get the response the client required. We are so happy to hear that it was a success.